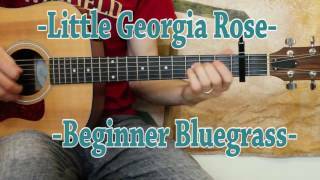 This is my arrangement of the Bill Monroe tune "Little Georgia Rose" in the key of A. I've created a nice beginner bluegrass style arrangement for those of you looking to learn some basic vocabulary for playing bluegrass guitar. I've created a solo for the verse and chorus so you're ready to take your break over either part at the jam! Whether you're a beginner or new to bluegrass this lesson is intended for building some fundamental licks and approaches when soloing in this style. Go ahead and give it a listen!